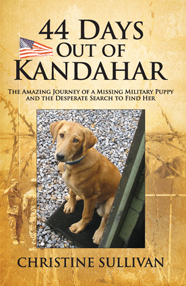 In this uplifting story of hope and inspiration, a scrappy camp puppy begins her young life alone on a military base in Afghanistan. Cinnamon was just a puppy when she found her way into the hearts of many of the service men and women stationed on the base where she lived. One in particular, Navy Reservist LCDR Mark Feffer worried for her future when most of the troops who cared for her were due to rotate out of the region. Who would care for her then? Getting ready to rotate out himself, Mark decided to adopt her and take her home. Along with countless others, Mark helped care for Cinnamon and prepare her for her journey. An experienced dog handler was to accompany her to the U.S. Her story just begins when her rescue from a sub-existent life as a camp mascot goes awry. Cinnamon was due to arrive at Chicago’s O’Hare International Airport at 4:30 on a Friday afternoon, but when Cinnamon’s flight landed in Chicago she wasn’t on it. No one knew where she was. The dog handler entrusted to bring her home had abandoned her in a foreign country without contacting anyone. Was Cinnamon alone without food and water? Was she injured and in need of medical attention? Or was she lying lifeless on an airport tarmac somewhere? Would anyone ever know what happened to her? As the story unfolds, you’ll relive the amazing true story of the nearly impossible international search and rescue to find Cinnamon. From her lonely start when her mother disappeared, to her endearing puppy antics entertaining the troops, to the extraordinary events that strung together and changed her life, you’ll learn how Cinnamon changed the lives of all those who cared for her forever.